This article explores the best sitting posture. As a nation we do a lot of sitting. A dozen studies or more support the undeniable truth that sitting for long periods of time increases your chances of diabetes, obesity, spinal degeneration, and even shorten your lifespan by 50%(1)! While we can’t always avoid sitting we can find the best and most correct way to sit. Proper sitting position will reduce pain, improve posture, mitigate common postural distortions such as forward head posture and maximize productivity(2). 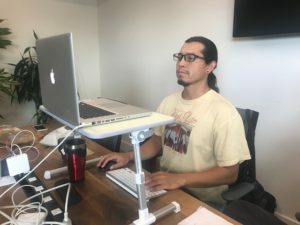 One very good option is a combo approach of sitting and standing desks. It takes your workstation and allows you to sit and stand without having to move all your hardware. One company that is leading the way in affordability and versatility is Varidesk. Set up is easy. Employers will cover the cost for a unit like this because it supports proper ergonomics and improves productivity(3). The point is to get you to move more and not be in one position for too long. Learn more about best workstation here. The great thing about a kneeling chair is it increases the angle between your torso and your legs. 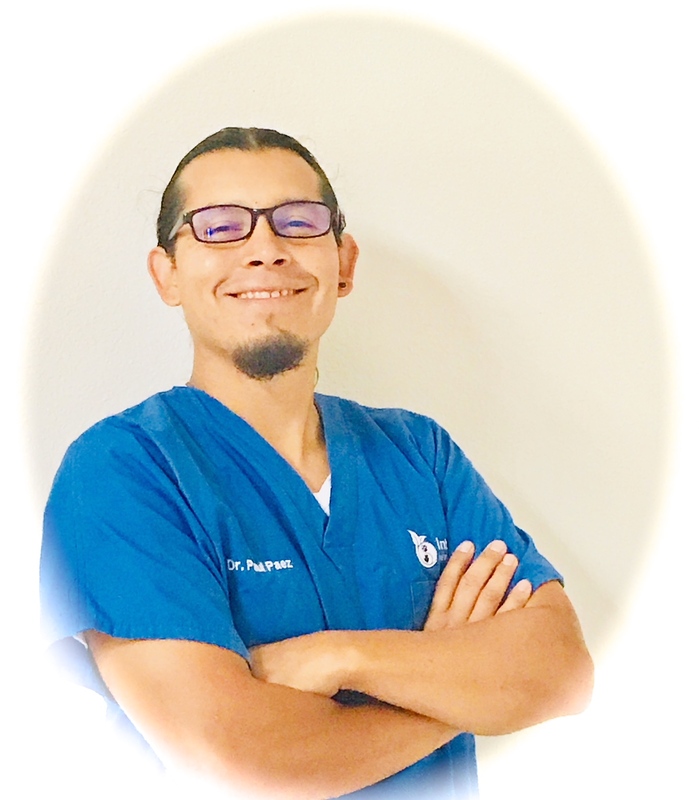 This position serves to alleviate the stress on your spine as well as lengthen the hip flexor muscles that are commonly associated with back problems. The laptop lends itself to serious bad posture scenarios. The monitor is mechanically designed to low and forces the user to slouch and look down for long periods of time. The posture that develops over time is called forward head posture. 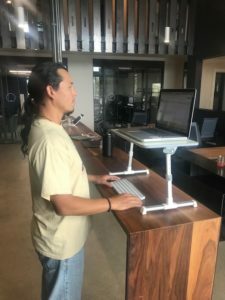 The best solution for the best sitting posture at a laptop is to use a portable laptop table – like the one created by Avantree to raise your monitor. Add a mouse and keyboard with wire or bluetooth. The best car posture is about aligning your body while still maintaining your safety. This includes aligning your head and shoulders while supporting your low back. For safety reasons it is important to keep your head no more than 2 inches from the headrest and the top of your head should not be higher than the headrest. Align your ear with your shoulders. Set the back of seat so that you can reach the wheel and still have the upper arms relaxed and not over extended. The goal is to lift the rib cage and avoid the low back from collapsing toward the seat. Add support such as a pillow that can be shifted from lower back to below mid-back. Learn more about the best car posture. Deep bucket seats can lead to tilting of pelvis. Uneven pressure on your hips and tail bone are alleviated with a supportive cushion. Postural braces are effective ways to help keep you upright while sitting. You can see a list of Posturepossible’s favorite back braces on our page: Posture Brace Comparison. 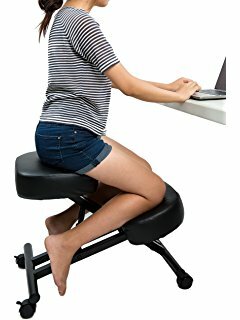 An effective posture device is helpful when you can’t get out of sitting for long periods of time. They help reduce fatigue and are effective for correcting slouching posture (4). A posture device acts as great reminder to sit up straight. 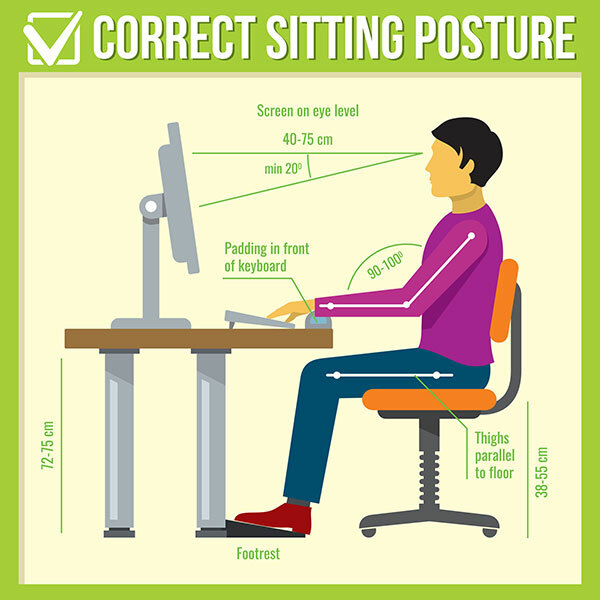 Proper sitting position can alleviate many conditions related to poor sitting posture. Follow the tips above to help improve your overall posture. Also, change positions every 15-20 minutes. Whether at a sitting desk or standing desk or a combination you need change positions often.